Clean chicken and chop into pieces and keep ready. Then heat 1/2 tbsp oil in a pressure cooker, add crushed garlic, ginger, onion and fry well. After that add chicken pieces, turmeric powder, chilli powder, coriander powder,enough salt and stir well, no need to saute. and add 1/4-1/2 cup water and pressure cook for 2 whistles. Now heat oil in a kadai, add the ground spice powder let it sizzle. Then add the finely chopped onions, curry leaves and saute till onion turns light golden brown. And then add chopped tomato and saute till tomato turn mushy and add chicken masala powder and stir fry well. Then add cooked chicken pieces without water and sprinkle little salt and stir fry for a minute. Now close the kadai with lid and simmer for 2-3 minutes. 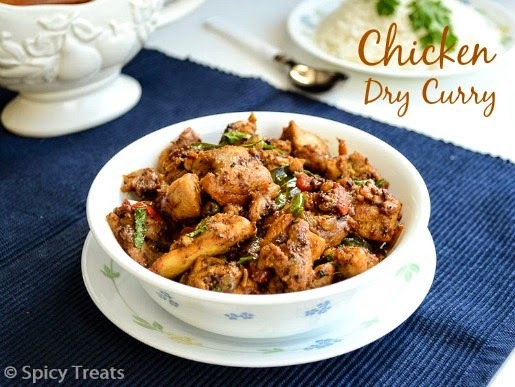 That's it..Spicy & Flavorful Chicken Dry Curry ready. If you want to make it a gravy type add the chicken with its water content and cook well. 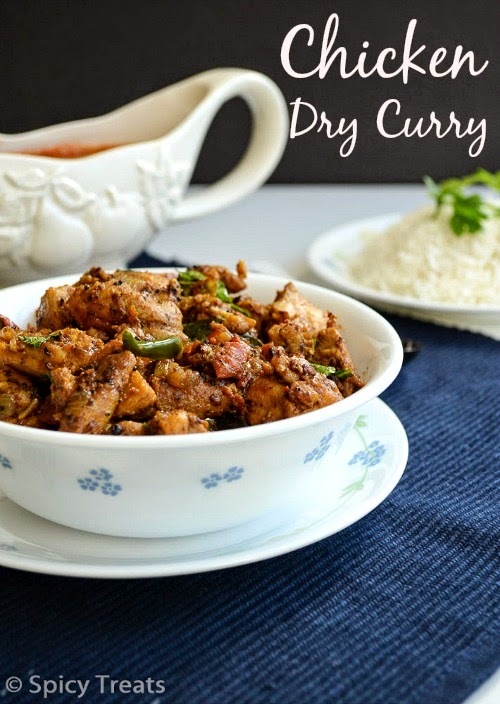 This above mentioned chicken and spices level gives medium spicy chicken curry. it in the recipe. If so, use 1 tsp ginger garlic paste along with onions and saute it. But i recommend to try it this way, so that the chicken is soft, juicy and well coated with the spices. Left over chicken cooked soup/water can be served with plain rice. I used homemade chilli and coriander powder and Aachi brand chicken masala powder. 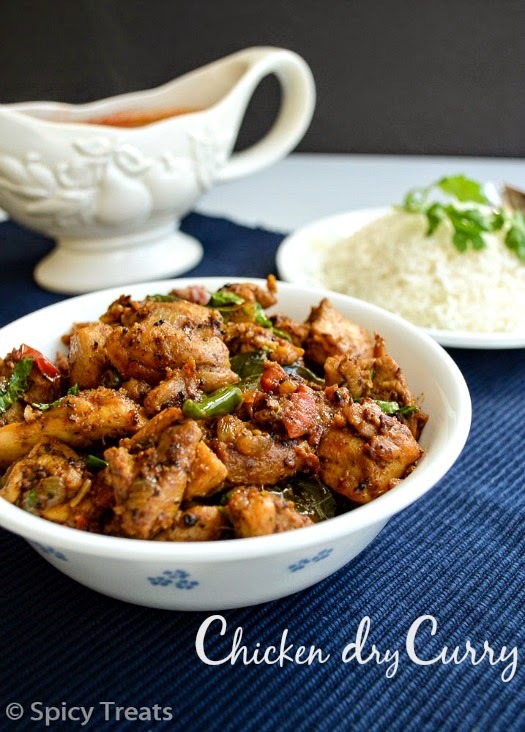 Yummy chicken side Sangee makes me drool :) with rasam and white rice nothing can beat this combo. Welcome back to blogging sangee! 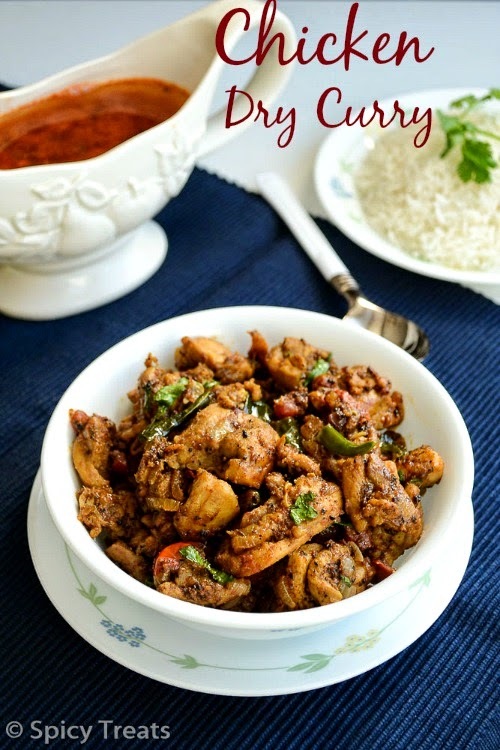 This chicken curry makes me hungry, with a bowl of rasam rice i can have this spicy and droolworthy chicken curry. I always love curry! This one looks great and would b nice having it during warm! 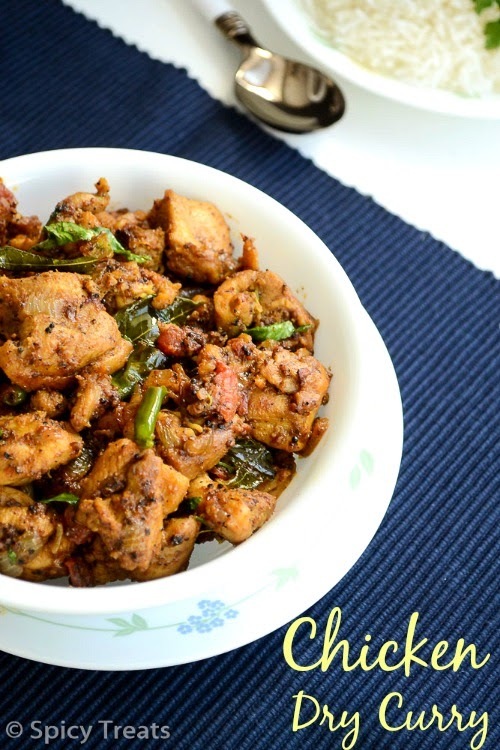 chicken looks so delectable that am feeling hungry now...pass me the bowl,yummmy dear !! can I use boneless chicken instead of chicken with bones? Yes.,you can use boneless chicken too.